Every once and a while a book comes along that catches you off guard with how good it is. This book was like that for me. Unfortunatley, as many others have already stated, the book suffers from “chick-lit cover syndrome,” that is many are unlikely to pick it us since it features a pair of yellow high heels and an ice cream cone. The book focuses on Lillian Dunkle from her youth as a Jewish immigrant living in a New York tenement up to her life as a successful ice cream magnate. Lillian is run over by a horse as a girl and taken in by an Italian family where she learns to make ice cream. Through will and determination Lillian makes a name for herself and shows herself to be a shrewd, and sometimes merciless businesswoman. This is a classic rags-to-riches story but it focuses on a woman, and the world that she had to survive in to reach the top. I loved the character of Lillian. Even though she is a crippled at a young age, she’s not a sympathetic character. Nor is she incredibly likeable. She is not described as pretty or kind in any way, and contains none of the traits found in your typical female protagonist. Instead she is clever and smart, knowing her weaknesses which she plays to her advantage. There is something inherent in Lillian however, that you can’t help admire, even if you don’t particularly like her. I especially loved that fact that she married Bert, a good looking, kind hearted man who many see as “way out of her league,” without having to justify it. I was worried that the author was going to do something like make Bert gay, and have Lillian act as his beard, but he genuinely loved his wife and found in her the characteristics that we as readers also fell in love with. This story is the history of so-many things. It’s the history of the immigrant experience in America, it is the history of the New York’s Lower East Side, it is a history of America itself starting driving through both World Wars, the Depression, Communist witch-hunts, the nuclear families of the fifties, the psychedelic sixties and seventies, and all the trends that accompanied it. It is also a history of ice cream providing interesting pieces of information peppered throughout. I absolutely loved this book, but be warned, reading will make you want to eat ice cream. 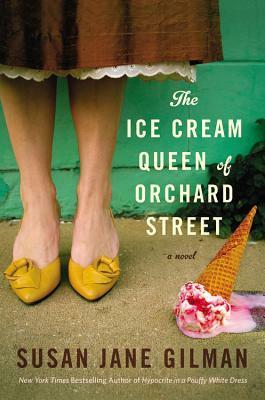 This entry was posted in Reviews and tagged America, Historical Fiction, Ice Cream, Ice Cream Queen of Orchard Street, Immigrant Experience, Lower East Side, Novel, Review, Susan Jane Gilman, Tenements, United States on April 2, 2015 by kwils3.